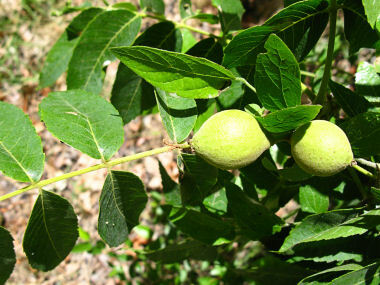 Arizona Walnut is a member of the Walnut Family. It can grow to 50 feet in height and 3 feet in diameter. It has grayish brown bark that becomes deeply furrowed as the tree ages. 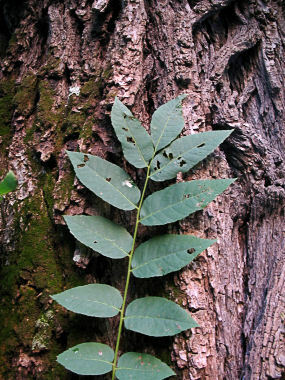 Leaves are green and composed of 9-13 lance-shaped leaflets each of which grows to 4 inches in length (the entire leaf grows to 14 inches in length). The tree grows along streams and in canyons in upper desert, grasslands and oak woodlands at elevations between 3500-7000 feet. Arizona Walnut is also known as black walnut. Seeds are a favorite of squirrels. Arizona Walnut blooms before or during leaf development and produces greenish, petal-less flowers. Female flowers are followed by a circular, green fruit to 1.5 inches in diameter which contains the walnut seed.